Enquire or book a trip along Cái Bè - Cần Thơ - Rạch Giá. Boarding back onto the Bassac at the Ninh Kieu pier, welcome drink. Lunch as the Bassac cruises up river Can Tho and crosses the sleepy floating market at Cai Rang. 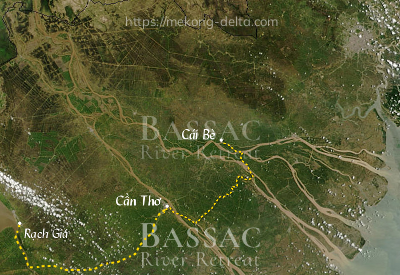 The boat then entes the very active Xa No canal, the main river link of Hau Giang province. The canal is lined with waterlocks and connecting canals dug in the early XXth Century to help foster rice production. Visit on shore in teh second half of the afternoon, in the vicinity of Vị Thanh. Boarding back at nightfall, and dinner after a light refreshment as the Bassac resumes her long cruise towards river Cái Lớn. The Bassac casts anchor for the night once past the quiet town of Go Quao. As there is no light pollution, if teh weather is clear, the early morning sky is full of stars. As she enters the brackish waters of the estuary, the Bassac may send schools of silvery fish flying. By clear weather, one can see above the trees the peak of Hon Tre island, in the gulf of Siam. Arrival at the Xèo Rô or Tắc Cầu ferry pier by mid-morning, check-out and transfer to shore. End of services by mid-morning on shore at Rạch Giá.